This fashionable oak frame wall desk provides a solution for your information technology storage and security needs. This versatile workstation has ample space for CPU, monitor, keyboard & mouse. Colors: beige & light grey (Contact Franklin Mills for custom color options). Construction: heavy gauge steel, Size: 441⁄2"H x 23 7/8"W x 4"D. Contact Franklin Mills for special pricing. Oak frame and heavy gauge steel. Minimal protrusion into hallways: 4" when closed, 13 1/4" when open. Keyboard tray tilts independently, up to 9 degrees negative tilt. 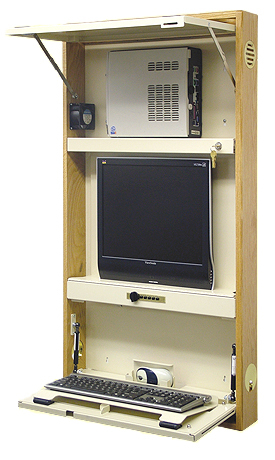 Large monitor compartment can accommodate up to 22" monitor. Programmable push button lock with automatic security mechanism for keyboard compartment. Variable height monitor mounting with 75 and 100 mm. Side ventilation opening allows for proper heat dissipation. 4 1/4" x 4 1/4" rear cut out for power and data outlet. Smooth operating dual gas cylinders with closure adjustment for the keyboard tray. 3-year warranty (1-year on gas spring and lock). 18 CFN exhaust fan option available at extra coat. Oak frame and beige panels.